Where the Wild Things Are and The Road the two movies I have been looking forward to the most this year, and I'm sure the two movies that will let me down the most this year. 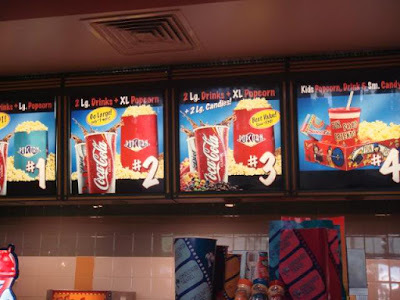 Here's the plan, I'm going to go the theatre right after work and skip diner in lieu of a combo #1 large popcorn (double butter layered, DBL) large Coke, big bag of M&M's. I'm thinking that will get me through four hours of movie watching. Just for curiosities sake I've decided to go on the Internet and calculate how many calories that is... it's actually unbelievable, you're probably going to think I'm exaggerating. Go ahead check for yourself I dare you. Grand Total: 2588 Calories, 147.5g fat, and 283.4 carbs !!! That's amazing, if I take a multivitamin after that, I have my whole RDI covered for only 12 bucks. UPDATE: The Road doesn't come out until November, my prediction about WTWTA was spot on.